We sell raw fiber, batts, roving and yarns of all colors. Our studio is open by appointment only. Please contact us at 720-271-0318. Classes can be arranged in wet and needle felting as well as dyeing techniques for silk and wool fibers. We continue to have our alpaca @ Paradise Valley Alpaca Ranch which is now located in Ridgway Colorado. If it is fiber you are looking for, we have mill spun yarns, in natural & hand painted (dyed) yarns and rovings. The shop features items from the herd on our Ranch. We sell raw fiber, batts, roving and yarns of all colors. Felted fiber art has been our focus for the past 3 years. We sell at many upscale venues. We have felted vests, jackets, dresses, purses, hats and scarves. We have introduced our new wearable art line of dresses and tops . There are samples for sale. These can be custom made specifically to your body measurements and color specifications. 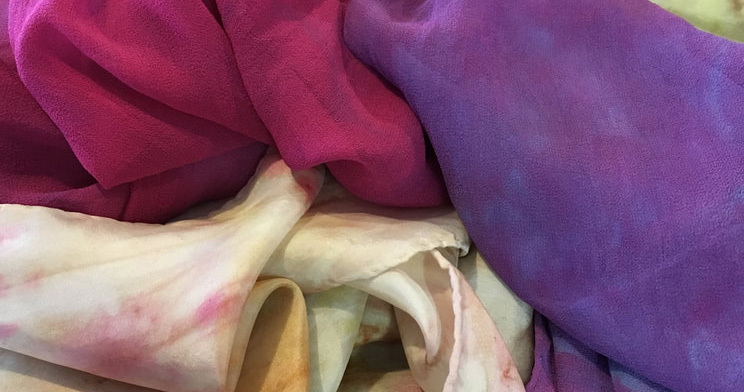 A resist of your body is made, then hand dyed silk and wool fiber is arranged to create a one of a kind creation. Wet felting and fulling reduces the size from the original layout as much as 50%. The end product is strong and can be worn for many years.